I was in this band called Aussie Blockchain Cryptokitties back in college. We were so /\/\etal. There is so much relevant news on the very subject of Blockchain. The first news item “World First: Blockchain Will Power . . . ” reports that the ASX (Australian Securities Exchange) will implement Blockchain technology in its post-trade clearinghouse system. This is precisely the (presumably) private network implementation of blockchain technology that I’ve been seeking. 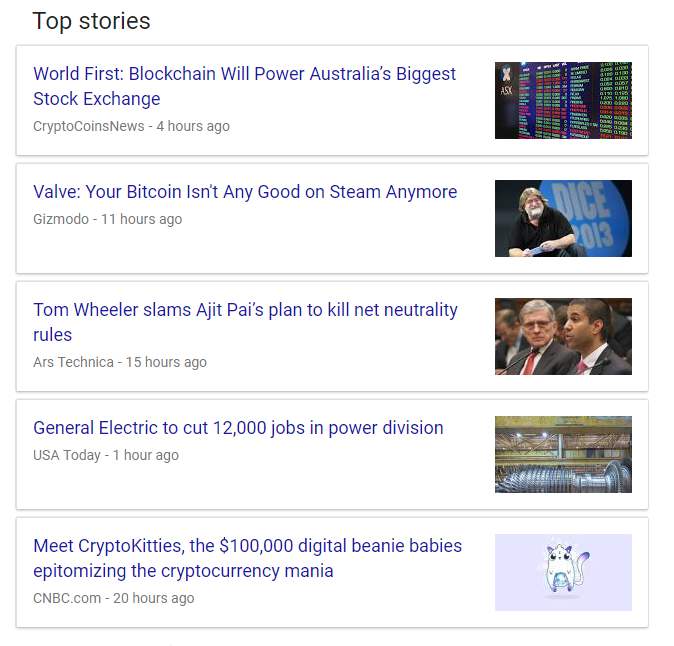 And then, the second news items “Valve: Your Bitcoin . . .” reports that Steam will no longer accept Bitcoin for payment of services. I recently purchased a laptop capable of running Steam and its games, but alas I have no Bitcoin so this will not affect me. I was not surprised to learn that they had been one of the few retailers to accept Bitcoin payment. But wow, the unintended consequences of Bitcoin’s steep rise in value have produced high costs in fee processing and time. I will have to research how many merchants accept Bitcoin and how many will leave the platform for the same reasons as Valve. I didn’t read the third news item. The killing of net neutrality is a big bummer. This makes me sad. I also didn’t read about GE cutting 12,000 jobs in power division, which is also sad. But the last item – “Meet Cryptokitties, the $100,000 . . .” seriously how can I not check up on this Blockchain related tidbit? Actually, this Blockchain related article dovetails nicely with the previous private Blockchain ASX article AND the public network Bitcoin article as the Cryptokitties referenced exist on the Ethereum network. Ethereum is a public blockchain network for distributed apps and has some notable differences to Bitcoin. Read the article to get a good taste of how people are spending their time and money on Blockchain dependent digital assets. And now to further ponder private network applications using Blockchain technology, and where the next digitaldoggies might show up.